or I can't quote postage. I accept PayPal (including credit cards), or Checks. under 14 years of age. Paint tips at bottom of page. Measurements may very slightly. .
Click on images for closer view. Metal Foods, Pots and Pans and Kitchen Appliances, Cookie Cutters, Nut Crackers, Soda Fountain Supplies, Shakers, Trivets, Silverware, Plates, Bowls, Glasses, Silverware, Sugar & Creamers, Coffee Pots and lots more. While these tables gather 1:12 unfinished metals into one place, they will also contain other scales because sometimes these smaller items can be used in one inch scale. You will be able to tell that these items are smaller because they will tell you to see another page where the rest of that scale is listed. Please note that I did not list all of the quarter scale or half scale kitchen items. If you need a smaller size, please check one of these pages to see if there is something there that will work. 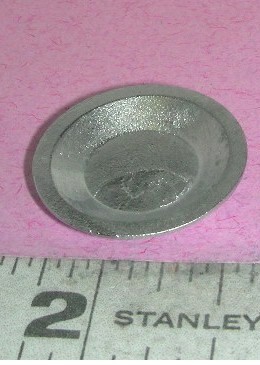 3/8" tall x 1/4" dia. 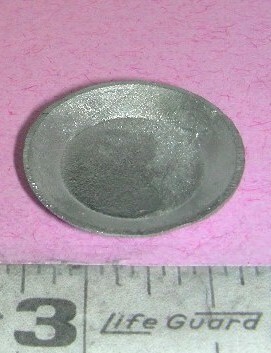 3/4" tall x 1/2" dia. Pears, or other fruit, or Potatoes. Too large for eggs. 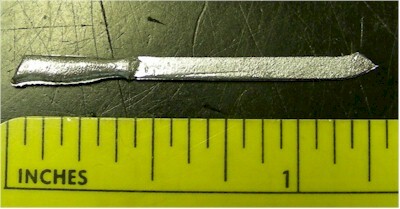 1-1/4" long x 7/8" dia. 2-1/5" long x 5/8" dia. 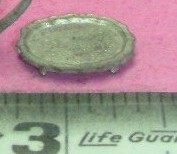 1-1/2" long x 1" dia. 1" dia. bowl x pitcher 3/4" tall . Sold as set or individually. 810 Electric Waffle Iron 2 pcs. 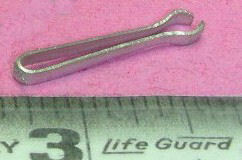 1" x 5/8" 2 pc. Contains one of each cookie cutters. 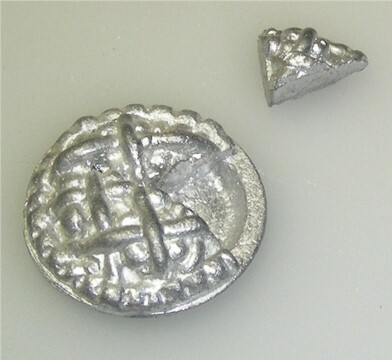 $0.39 ea (25 in stock). $32 (3 in stock) Dish sets can be made to order. 3/8" tall x 9/16" dia. 1/2" tall x 1" dia. 442 Cake Cover & Stand 2 pcs. 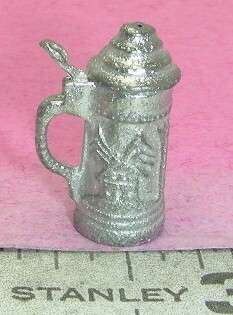 1-1/8" tall x 7/8" dia. 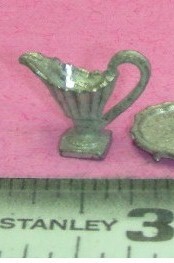 536-A Gravy Boat & Tray 2 pcs. 536-B Gravy Boat & Tray 2 pcs. 645 Revere Silver Bowl 8"
816 Serving Dish w/ Top 2 pcs. 7/8" tall x 3/8" dia. 1/2" tall x 3/8" dia. 164 Sugar & Creamer 2 pcs. 845 Footed Tea Set 3 pcs. 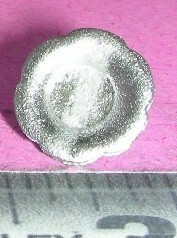 To paint metal miniatures, first prime with Zinssar Bullseye 1-2-3 Primer, made specially for metal, glass and plastic. See Supplies page for small container. 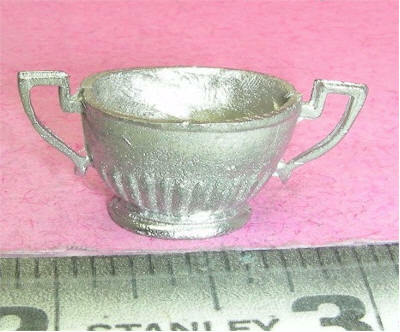 (available at home improvement centers, paint stores and hardware stores) After the metal miniatures are primed, you can paint with any craft paint, and then either paint or spray with a sealer like polyurethane or other clear acrylic sealer. Special orders welcome. Please e-mail for orders and prices. Please include your Shipping address and Phone on orders. 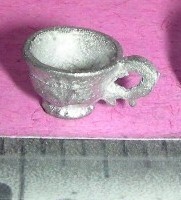 Check out our ads; Artisans' Loft, Virtual Mall, and see Related Sites for more miniatures for sale. Also check out the individual ad pages. All Photographs on this site are the property of Virtual Dollhouse and its advertisers. Anyone using the photographs without the permission of the owners will be prosecuted.